We have come to the end of the most incredible month in India. 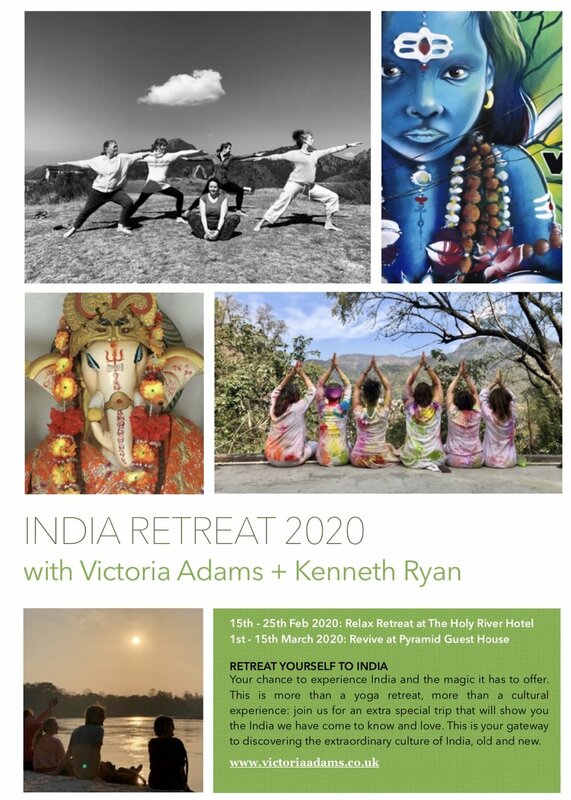 There has been much interest in future retreats in Rishikesh and, yes, we will be running 2 retreats next year. Booking is now open! 10 nights in a hotel with all the comforts you would wish for! Immaculate en suite bathrooms, air conditioning, food to delight both the Western and Indian palette, modern world service and facilities and a 5-minute walk to the River Ganga. 14 nights in an Indian-style guest house: a more affordable trip with more basic accommodation. All rooms have en suite bathrooms. We will contact you to complete the booking form and secure your place - a further deposit will be required before 1st June. If you have any questions in the mean time, please have a look at the FAQ below. If you wish to be notified of further retreats and events, please register your email below. A most extraordinary month in Northern India... It has been colourful, fragrant, wild and wonderfilled. 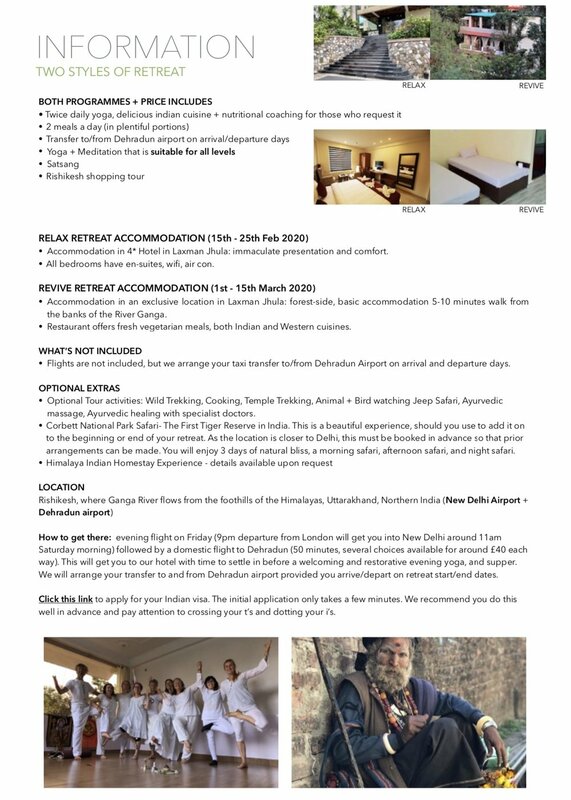 We have soared to the heights of the Himalayan hills and dived deep beneath the cool, soothing, holy and healing glacial waters of the Mother Ganga river. We have treaded lightly upon the foothills of the Himalaya earth, stretched lively on Yoga mats, at other times been as still as the mountain- so it appears to be. We have sung our hearts out with hundreds/thousands of fellow Yogis in unison and harmony at sheer celebration of life and our shared being-ness. In that we have cried tears of sorrow, many many more tears of joy and bliss our spirits together aflame. We have sat at the feet of great masters of the ancient teachings of Yoga, been lifted by their wisdom, our resistance to Peace softened in the space of their Love. We have come to quietness, unheard of; it is the silence that resists neither sound nor thought.. We have experienced blessings and kindness of spirit beyond anything we could possibly imagine. We have been inspired by the greatness of these resilient and formidable Indian, Nepalese and Tibetan people, many of whom live in such difficult circumstances with tremendous dignity and integrity. We have been deeply 'in this world' yet we have experienced happenings so transcendant that the arising has felt to be 'not of this world’…. Your chance to experience India and the magic it has to offer. Daily Yoga for all levels. This is your gateway to discovering the extraordinary culture of India, old and new. How do I know which Amazing India trip is for me? You will notice the obvious price differential. This alone may very simply help you decide. 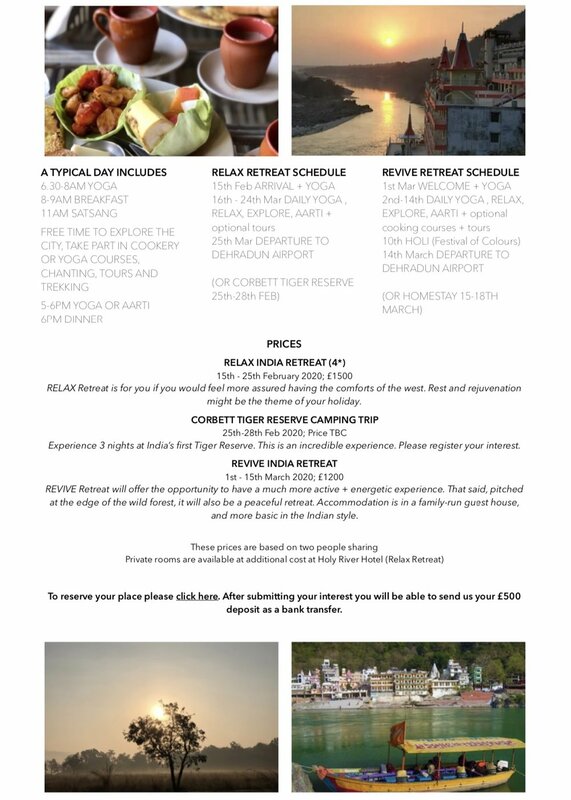 The Revive Retreat (1st-15th March) is for you if you don’t need the comforts that a 4* hotel would offer. This is Indian guest house-style accommodation, rustic and set up in the hills with a view of the River Ganges below. There is a rubbly uphill slope to walk to reach the guest-house - bring what you yourself can comfortably carry, and be confident walking. This retreat is aimed for an active nature loving, dare I say seasoned traveller. Relax Retreat is pitched to meet the needs of you who enjoys comfort, rest and respite. Discover India with the support and familiarity of western-style accommodation and yoga you love in the comfort of The Holy River Hotel. The perfect base to explore the neighbourhood, Holy River’s rooms offer you everything you need to unwind, relax and enjoy your stay in Rishikesh. Each of the elegantly designed guest rooms offer traditional comfort and contemporary style with en-suite bathroom and rooms are cleaned daily. India Revive at the Pyramid is aimed for you of reasonable fitness levels with the intention of enjoying at least a moderately active holiday. The Pyramind is situated 150 metres up a hillside slope. You will likely walk down and up this once or twice per day, so will need to be fit enough to enjoy this. It is perched above the more quiet side of Laxman Jhula town overlooking the mellow Ganga rapids. It is a very peaceful place. Indeed it is a pleasant place to rest, backing on to the forest that reaches into the hills. Accommodation is in a newly built guesthouse. It would not be fair to project Western star ratings upon it. These are a very comfortable and pleasant grounds with beautiful surroundings. It is functional rather than fancy and in true India style, certainly not fussy. The India Relax at The Holy River Hotel is aimed for you who enjoy creature comforts and like to be accommodated in 4 star luxury. From here you can venture out through the roads and alleys and enjoy the culture of India at your own pace. India is very vibrant and stirring in many ways. It is most wonderful, and you will have the comfort of knowing that as soon as you step back through the gates of Holy River, you will be cradled by the calm atmosphere and pristine rooms. If you are interested in nutrition, a well known master of Ayurveda, Dr Arora, is less than a minute’s walk away. Activities and treks are on the schedule, but should you choose to stay in the hotel and relax then this would be a more suitable retreat for you. Skyscanner or Kiwi Flights have a great search tool for the best flights to suit you. • VACCINES There is such differing advice and experiences that we have to say please err on the side of caution and cover yourself by getting the necessary vaccines for India. Be sure that your travel insurance is up to date also. If this is your first time traveling to the eastern world, the comfort of knowing you've taken due precautions will be very reassuring. • CLOTHES - always having a scarf/wrap will help to keep you warm and shoulders covered, especially but limited to visiting temples. By mid-march the daytime temperature is very warm. Evening time can be cool as the wind blows off the Himalaya from the east. It is adviseable to dress respectfully - short shorts are not advisable! • STURDY FOOTWEAR will be required for walks. If you feel more comfortable wearing a full-length ankle boot then do opt for that, though not essential. Sandals for during the day, though do travel light as there may be things you wish to buy in Rishikesh. • TWO CHOICES OF RETREAT - WHICH DO I CHOOSE? You will notice the obvious price differential. This alone may very simply help you decide. Perhaps certain dates are better suited to your schedule. The Revive Retreat is essentially a less expensive accommodation in Indian guest-house style. It operates on a karma yoga basis - rooms are not cleaned daily and it is your responsibility to keep your environment as tidy as you wish. The Relax Retreat is pitched to meet the needs of you who enjoys comfort, rest and respite: pristine en-suite bathrooms and a daily cleaning service. Both retreats are experiences that you will never forget.